We are extremely excited to welcome Vinny Lingham (Twitter, Linkedin) to Multicoin Capital as General Partner. Vinny is the CEO of Civic, a solution for identity verification on blockchain. He was also previously the founder and CEO of Gyft & Yola, Inc.
Vinny is a deep thinker in the space, understanding both the technology and the business implications of crypto. He’s one of the most widely recognized and followed individuals in the ecosystem. He will be joining our investment committee and play an active role in sourcing deals. Below is a blog post written by Vinny regarding this announcement. We have also issued a press release, located here. 2017 was, without a doubt, the year that crypto trading and investing came out of the shadows and into the mainstream consciousness of everyone in the technology world, and beyond. When my company, Civic, conducted a token sale back in June of this year, we had as many as 50,000 people waiting in a queue, to purchase our tokens, and we concluded a successful $33m token sale. We were one of only a few dozen companies that had attempted to do anything like this, and at scale, where the tokens were sold to thousands of people, around the globe and we required everyone to use a Civic account to signup and make a purchase — which to some degree helped reduce the incidences of people buying multiple times and depriving others of the opportunity. This resulted in around 10,000 people participating in our tokensale, which was in stark contrast to others that had maybe a few hundred. This allowed us to build a network effect for our product and engage with people who wanted to be a part of what we are building — the passion for the product has been overwhelming and we are still struggling to deal with the all the leads & opportunities that we are receiving from our network of token holders, who want to help us build the network and see the network succeed because they are a part of it. 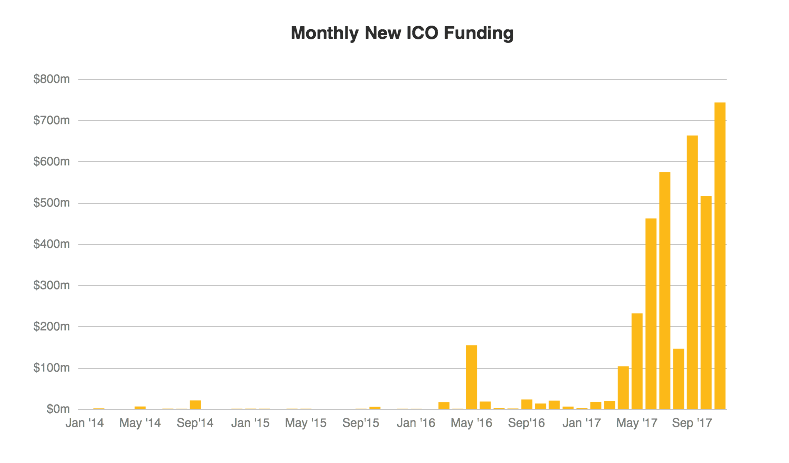 Since then, raising money via ICO’s & token sales have reached epic proportions — over $3bn has been estimated to have been raised this year. I explained a lot of why this is just the beginning of a New Financial Revolution and Why Tokens are eating the World. Given the success of our utility token sale, and the lessons learnt, I’ve given much thought as to how Civic could democratize other areas of finance, and eventually society. One of these areas is by broadening the access & availability of investment opportunities to the broader market. Due to a number of laws in the US and other parts of the world, crowdfunding and pooling capital into investment funds is an activity that is highly regulated and costly to execute at scale. This means that investment funds do not bother raising money from thousands of people with median wealth or income, they focus on HNWI (High Net Worth Individuals). This typically translates into a situation where the very wealthy get access to the best investment vehicles. There are laws in the US and other parts of the world, for example, that conflate wealth with intellect. For example, in the US we have laws that require certain investment products only be offered to “Accredited Investors”. In the United States, to be considered an accredited investor, one must have a net worth of at least $1,000,000, excluding the value of one’s primary residence, or have income at least $200,000 each year for the last two years (or $300,000 combined income if married) and have the expectation to make the same amount this year. This means that a young adult in their twenties, who has some savings but no real wealth accumulated, is precluded from investing in funds or companies because they are not deemed to be sophisticated enough to take on the financial risk, because their wealth does not meet the requirement as stipulated by the legal framework for investing. Now, understandably, there are good reasons for why these laws exist — and it’s really to protect the uninformed investor (so this would be grandma or grandpa, for instance) who has no idea what a cryptocurrency is, and would probably fall for any scam that walked in the door with the promises of overnight riches. These laws have their place but created unintended consequences. My point, is that one’s wealth or income does not define their intellect or sophistication — knowledge is gained from experience, research and engagement and if we solely rely on accumulated wealth or income as a means to gate people from high growth investment opportunities, then we may see a world where the Gini co-efficient continues to rise and the youth in countries like South Africa will eventually rise up and overthrow the government because of the high levels of inequality. I’m pleased to announce today that I’ll be joining the team at Multicoin Capital, as a General Partner. I highly recommend that you signup for their crypto research newsletter on their website. Multicoin Capital is a long term crypto hedge fund that currently can only serve wealthy High Net Worth Individuals (HNWI’s) and select corporate investors and funds. I’ve been spending some time with the team there over the past few months discussing crypto and I must say that I’ve learnt a lot from them over this period. Tushar Jain & Kyle Samani have very deep views on the crypto ecosystem and have produced some insights which I’ve been pretty impressed by. We’ve been spending time on the topic of democratizing crypto investing and have come to the conclusion that we could enable crypto investing, at scale, by leveraging Civic to comply with regulations, using our identity verification technology to ensure full regulatory compliance. I can’t provide too many details about what is being planned, at this stage, but I look forward to being able to announce something early next year. This additional role will have the intended consequence of providing me with more time to focus on Civic, in that the team at Multicoin are very talented and I will be trusting them to manage the bulk of my cryptocurrency investments going forward.